This post was meant to go live a few months ago. My skin had finally settled down and before that I’d been frightened to try any new products, in case they exacerbated my breakouts. I finally took the plunge and started trialling new skincare. Unfortunately, I got pretty sick around the same time. I was signed off work for three weeks and couldn’t even get out of bed. Since then my skin has been a mess. I’ve finally been to the doctors an prescribed an ointment which should hopefully calm down my breakouts. I know that its hormonal, and nothing to do with skincare, so I’ve decided to share this post with you anyway. The Ren Evercalm range is for those sensitive souls amongst us. 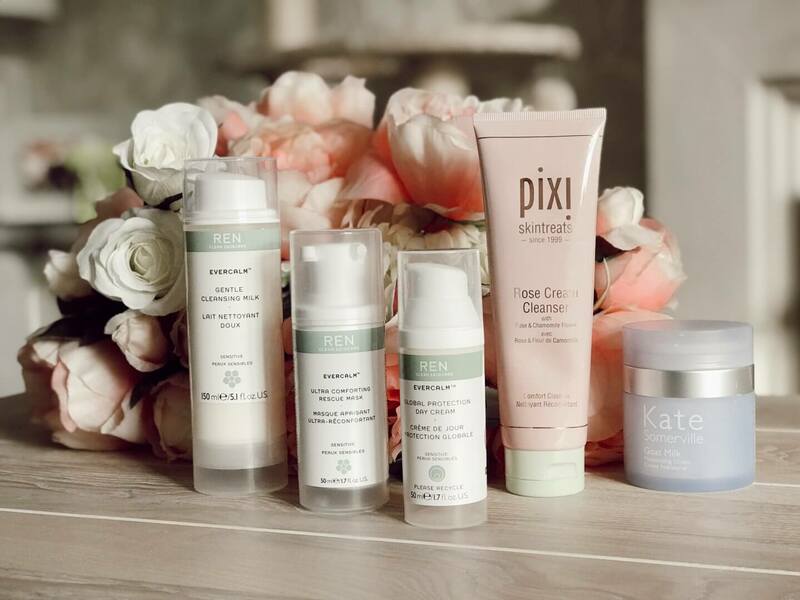 If your skin is a little unhappy and reactive, this range is for you. I was happy to try out this range despite my skincare nightmare based on the fact it is designed to be gentle. I have to say, it’s probably the kindest cleanser I’ve ever applied to my skin. Wonderfully gentle and leaves my skin feeling clean but not devoid of all moisture. I’ve used this as a second cleanse and as a morning cleanse and would recommend you do the same, I wouldn’t waste this removing my makeup. One pump is more than enough. I massage it into my skin, then remove with a damp face cloth. There are three natural bio-active ingredients in this cleanser; Blackcurrant seed oil which is full of omega 3 to soothe, Seabuckthorn Berry Oil which is rich in Omega 7 to soften, and finally Fennel Seed Extract to combat pollution. This really is a lovely product. When my skin is particularly oily, this cleanser would not be sufficient to clean my skin, as I feel that my skin is left with a moist film on it after using, whereas I prefer it to be feel completely clear. On dry skin (the good old days) or winter parched skin I believe this would be perfect. I’ll definitely be using this again if my new ointment causes excess dryness. As ever, I want to be honest with you; rose is a scent I usually try to avoid. It conjures memories of powdery rose bubble bath from childhood. Pixi have showed me the error of my ways and I’m now embracing the rose. This thick cleanser contains mineral-rich mud to detoxify the skin, with rose and avocado to condition. I’ve been using this as my first cleanse to remove makeup. A small amount goes a long way and I simply remove with a damp face cloth. All makeup is inhialated by this cleanser. This is another lovely product from the Ren Evercalm range. I wish I’d had this product in my life years ago, as I used to have very dry skin. If you’re suffering from sensitivity, or a reaction, I’d definitely be applying this to your skin. Your skin is left feeling calm and moisturised. You’re advised to use this three times a week if your skin is in need of rescuing. The bio-active ingredients in this mask are; white mushroom extract, which is acts as a natural analgesic (who knew? ), beta-glucan from yeast, which helps accelerate skin regeneration and finally arnica extract, which reduces iritation, inflammation, stinging, burning and redness. I’ve read that the ointment I’ve been prescribed by my doctor can cause sensitivity and extreme dryness. I’ll definitely be reaching for this mask if and when the time comes that my skin needs rescuing. I have wanted to try Goat Milk forever. I asked my lovely husband to head to Sephora when on a boys trip in the US. I was so excited for him to return with it too. I absolutely love this product. My skin was left perfectly in balance; it wasn’t too heavy and it was just the right amount of moisture over the summer. Luckily for you, Cult Beauty now stocks Kate Somerville, so need to beg someone visiting the US to get it for you. As expected, the moisturiser includes goat milk, as well as jojoba and avocado oil, which is said to leave the skin soft, supple and smooth. I completely agree with this. I used every last drop of Goat Milk and was about to repurchase, but found the Kate Somerville Oil Free moisturiser. I’m currently using this and will report back. Another product in the range designed to soothe skin. This is a very gentle moisturiser, which is actually a lot heavier than I was expecting. I didn’t find it absorbed quickly into my skin, but as I’ve said throughout this post, my skin has been very oily over the last few months. In previous years, the winter leaves my skin excessively dry, so I will definitely reach for this if the time comes again. Unfortunately at the moment, this moisturiser is just too much for my skin. The bio-active ingredients in this product are three oils; blackcurrant seed oil, seabuckthorn berry oil and camellia oil. Unlike the other two products in the range, if my prescribed ointment does dry me out, I won’t be using this, as it is advised to use oil free moisturiser. What new skincare products have you been trying recently? I had no idea that Ren was that great for sensitive skin, I’ll have to give some of their products a go! I am really curious about these products! Specially Pixi’s cleanser! My skin always gets more sensitive with the cold, windy weather. Thank you for the review!